Minnesota Bureau of Criminal Apprehension (BCA) investigators process the scene. The shooting of Philando Castile occurred on July 6, 2016, in Falcon Heights, Minnesota, a suburb of St. Paul. Castile was pulled over on a routinetraffic stop. A St. Anthony Police Department officer, Jeronimo Yanez, asked for Castile’s driver’s license and vehicle registration. According to Diamond Reynolds, Castile’s girlfriend, who was with him in the vehicle, Castile told Yanez he had a firearm that he was licensed to carry. Yanez then shot Castile, who died shortly after arriving at the hospital. A video of the immediate aftermath was live streamed by Reynolds. Philando Castile (July 16, 1983 – July 6, 2016) was 32 years old at the time of his death. Castile’s Facebook page said that he attended the University of Minnesota. He graduated from Saint Paul Central High School in 2001 and worked for the St. Paul Public School District from 2002 until his death. Castile began as a nutrition services assistant at Chelsea Heights Elementary School and Arlington High School (now Washington Technology Magnet School). He was promoted to nutrition services supervisor (cafeteria supervisor) at J.J. Hill Montessori Magnet School, a Montessori school, in August 2014. In a press briefing at the scene, interim St. Anthony police chief Jon Mangseth said that the shooting was the first officer-involved shooting that the department had experienced in at least thirty years. In Minnesota, as a whole, at least 148 people since 2000 have died after being shot, stunned by a Taser, or restrained by a police officer. No charges were brought against any officer in any of these deaths, with a grand jury, a county attorney, or the United States Attorney finding a lack of probable cause in 134 cases. At the time of Castile’s death, five fatal police shootings remained under investigation in Minnesota. 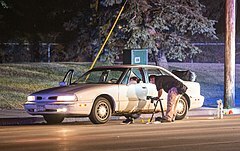 Castile was pulled over as part of a traffic stop by St. Anthony patrol officers Jeronimo Yanez and Joseph Kauser, for a broken rear light in Falcon Heights, Minnesota, a suburb of Saint Paul. The stop took place on Larpenteur Avenue and Fry Street. Riding in the whiteOldsmobile with Castile was his girlfriend, Diamond Reynolds, and her four-year-old daughter. Castile was the driver, Reynolds was the front-seat passenger, and the child was in the back seat. Reynolds said that officers had failed to check Castile for a pulse or to render first aid, and instead comforted the crying officer who fired the shots. Reynolds stated that Castile received no medical attention until paramedics arrived more than ten minutes after the shooting. The Minnesota Bureau of Criminal Apprehension is the lead agency in charge of the investigation. The Hennepin County Medical Examiner’s office ruled Castile’s manner of death as a homicide and said that he had sustained multiple gunshot wounds. The office reported that Castile died at 9:37 p.m. in the emergency room of theHennepin County Medical Center, about 20 minutes after being shot. By 12:30 a.m., protestors gathered at the scene, “peaceful but visibly angry.”More than 200 people were present. After news of Castile’s death spread, crowds of protestors gathered outside the Minnesota Governor’s Mansion, chanting Castile’s name and demanding that Governor Mark Dayton make a statement. My deepest condolences go out to the family and friends. On behalf of all decent minded Minnesotans, we are shocked and horrified by what occurred last night. This kind of behavior is unacceptable. It is not the norm in Minnesota. I promise … to see that this matter is brought to justice and all avenues are pursued and do a complete investigation. Justice will be served in Minnesota. Dayton said he had requested an independent U.S. Department of Justice investigation into the matter and had spoken toWhite House Chief of Staff Denis McDonough. The day after the fatal shooting, the St. Anthony Police Department identified the officer who fired the fatal shots as Jeronimo Yanez. In accordance with standard practice, both were placed on administrative leave. Mona Dohman, commissioner of the Minnesota Department of Public Safety, declined to say whether Castile had a concealed-firearms permit. 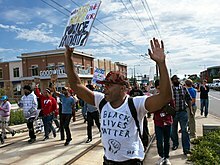 Nekima Levy-Pounds, president of the Minneapolis chapter of the NAACP, said that her group would request a federal investigation and called for an independent body to investigate the shooting, expressing skepticism with the Minnesota Bureau of Criminal Apprehension.